History: Hacienda Mexicana opened in the building that used to be Griggs Restaurant, a long time El Paso institution. Really nothing could replace Griggs, but Hacienda Mexicana served very high quality food (that unfortunately, few customers seemed to discover before the restaurant closed). The photos in this article show the classic El Paso style Mexican food, and I think the rich colors of the food give a good indication of the rich flavors they contained. In addition, though, the photo of the front of the restaurant is the best picture I have of the way the original Griggs Restaurant looked from the outside. The old Griggs Restaurant on Doniphan Drive was such a special restaurant that I think it is only appropriate that another high quality Mexican restaurant take its place, and this is what has now happened with the opening of Hacienda Mexicana in 2010. The building resembles a hacienda, with several large dining rooms, outdoor gardens, and a peaceful setting away from other buildings. It is not located in the country as it was when Griggs opened, but it still seems that way. Although I loved the food at Griggs, Hacienda Mexicana has made a change from Griggs’ menu and now serves a large variety of El Paso style Mexican food. I was impressed with the number of items on the menu that included such things as chicken mole (and other dishes that Griggs did not serve). 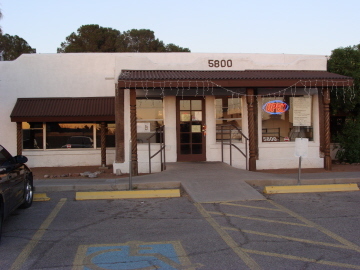 I should point out that the former chef at Griggs has opened Peppe’s in Canutillo (6761 Doniphan Dr.) where the former Griggs recipes are now served. Griggs (and now Peppe’s) is New Mexico style food, while Hacienda Mexicana follows the tradition of high quality flavorful El Paso style food that I regularly experienced in the 1980’s but now I find in fewer and fewer restaurants. Although the chips and salsa are not the most important part of most meals, they can detract from it if they are not good. The Chips here, though, were the first sign that it was a good restaurant. These were thick and well toasted, as they should be. The Red Salsa was thick with a strong chile flavor, made in a typical Mexican style. Of the two salsas this was my favorite. The Green Salsa was more spicy, but more runny and hard to put on the chips. 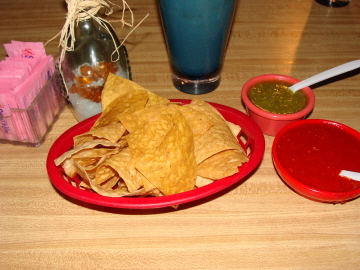 The fact that they served more than one salsa was a definite plus for the restaurant, allowing a variety of flavors. When I asked for suggestions about what to order, the waiter suggested a combination plate. This reassured me because on my first visit to a Mexican restaurant I like to try as many items as possible. However, this was still not an easy choice because they serve about six different combo plates, and each can be modified through substitutions. Thus the one I got was more or less my choice for the items I would like to try. The Chile Relleno turned out to be much like the one Griggs used to serve, with an excellent batter and no sauce on top. It was stuffed with Muenster cheese, and had a little cheese on top, but to me was the utlimate chile relleno in El Paso for its simplicity and goodness. 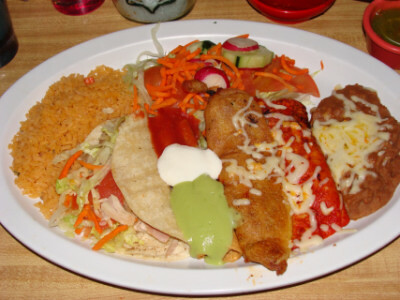 I want to start a list of “best individual items” at restaurants, and I know of no chile relleno in El Paso that could top the one at Hacienda Mexicana (in fact, it rivals the one at Chope’s in New Mexico). I probably could never pick the best Red Enchilada in El Paso, but the one at Hacienda Mexicana was close. This was made the classic El Paso style, with a flavorful red chile that was not too spicy. I do not like a lot of additives such as cumin, and this was one where the chile flavor was left to stand on its own with only a little help from additional ingredients (in other words, just right). The Flautas were served in the style of the “Mexican flag” with red chile, white sour cream, and a green guacamole sauce for color (the guacamole was a thin, pureed sauce). Although I thought the sauce was good, the flautas themselves were somewhat thin and dry (but not unusual for El Paso). The Chicken Taco had the same meat as the flautas, which I thought was rather unflavorful. I ordered the taco with a soft shell (normally it comes fried), but it seemed that the restaurant was really not expert at making flavorful soft tacos as some of the more authentic Mexican restaurants are. Probably when it comes to El Paso style Mexican food the crispy tacos are best (and probably beef should be ordered instead of chicken). The Rice was very flavorful and not dry. It tasted fresh, and not as if it had been sitting around for a while. The Beans pointed out the main problem I had with some of the food–they had a definite salty flavor. In fact, this one thing pointed out the main difference to me between Hacinda Mexicana being a very good El Paso style Mexican restaurant (which it is) and possibly being one of the best (such as Casa Jurado). I thought the chile relleno and possibly the red enchilada here were better than at Casa Jurado, and some of the other food could be equally good if they cut down on the amount of salt used. Hacienda Mexicana serves home made Agua Fresca drinks, including horchata and canteloupe (melón), but they said the lemonade comes from a mix. Overall it was a very good expeience. The price was very reasonable, and the service was good. The restaurant closes at 9 p.m., so I did not have to feel rushed in trying to get there early as I do at many restaurants. This was truly a worthy replacement for Griggs, especially since I feel they are serving the same chiles rellenos that Griggs used to have. This entry was posted in Closed by Steve. Bookmark the permalink. Have you ever run into the recipe for the orangish chile relleno sauce like they used at La Hacienda on the river? I love that sauce. Even called the restaurant one night (long distance from Arlington) to ask for it and the cook wouldn’t share it. If you have leads send they to me por favor. I don’t know about the recipe for this. However, some of the employees and the cook from La Hacienda opened Amigos Restaurant after La Hacienda closed. I believe some of them retired but some are still there. You might see what you can find out from them. Amigos had a fire in March, though, and since that time it has been closed and they have not been answering the phone. I went by the restaurant in late July or early Aug. and it was still closed but they had made some progress on reconstructing the roof and other repairs. If you want to try to call them you can find the phone number in my review on this web site. I will also try to get whatever information I can about their status. On the review I point out that the chile relleno is made with celery and cinnamon. I imagine the employees at Amigos can give you more details. All of the sauces at Amigos are very flavorful, and this is one of the things I like about the restaurant. It is possible that Amigos is even better than La Hacienda. The chile relleno, for instance, does not seem to be as greasy as it was at La Hacienda.